I swear that June's Classic Box came to me glowing with a singing chorus as I opened it. The ever sophisticated Mrs. Crosby does, indeed, love to play and the fiber content of her yarn does not disappoint. With a blend of 80% merino and 20% silk, her Carpet Bag yarn was love at first touch. Before I get into my project, let's talk about color. I can honestly say that there wasn't a color chosen for the boxes that I didn't like. Mrs. Crosby considers some of these colors nearly solids like the Hollywood Cerise and Sunset Regatta while others she calls multis like the African Grey and the Great-Tailed Grackle. They all work up with varying tonal changes from light to dark to light again, giving your final work additional depth. So...what to make with this decadent yarn that I would be completely content with just holding and petting? Initially, I thought the search for a crochet pattern worthy of my Great Tailed Grackle hanks would take some time. I wanted a pattern that would showcase the yarn's color and texture. I didn't have to look far. The Budding Crocus pattern designed by knottygnome crafts, Sara Peterson, came with the Classic Box and was a perfect fit. This pattern is great for both the beginner who is looking for a small, additional challenge with the puff stitch as well as the more advanced crocheter who wants a stylish pattern with easy to remember repeats. It's just what I needed for relaxing summer evenings of crochet. I could tell with my first few stitches that the Carpet Bag would have great drape to it. Throughout the pattern, I kept debating if I should plan to block the finished shawl or leave it as is. I think it would be great either way. Even if I do choose blocking, though, I don't think I'll need to do it aggressively. It may just need a light forming and nothing more. It's always such a joy working with a silk blend. I'm normally a pretty quick crocheter but with silks and silk blends, I find myself taking my time a little more, savoring the stitches and the feel of the fiber through my fingers. And when the yarn is a great color (especially my favorite color, green), my joy is even more enhanced. I wondered if great-tailed grackles ever coasted through fields of budding crocuses like I was with this project. So it's safe to say that I was truly lost in the pattern and the yarn while crocheting. I was so lost that I didn't stop where the pattern said I should to begin the border. I did the repeat two more times than I should have. What was there to do? With the additional rows, I didn't have enough yarn to put the ruffle edge on as written so if I wanted to do that, I'd have to rip back the last group of repeats. That's generally not something I like to do, especially with yarn as lovely as this. And it made me sad to do that with this project. I made the decision to do another row of puff stitches with additional stitches skipped between them so they'd lay on an angle and give a small, scalloped edge. I'm still debating on whether or not to block but I'm leaning more towards a light, spray blocking to finish off the shawl. I also haven't decided whether this is going into my gifting stash or if it will be staying in my personal wardrobe. Since it's my favorite color, I think it's home may be with me. 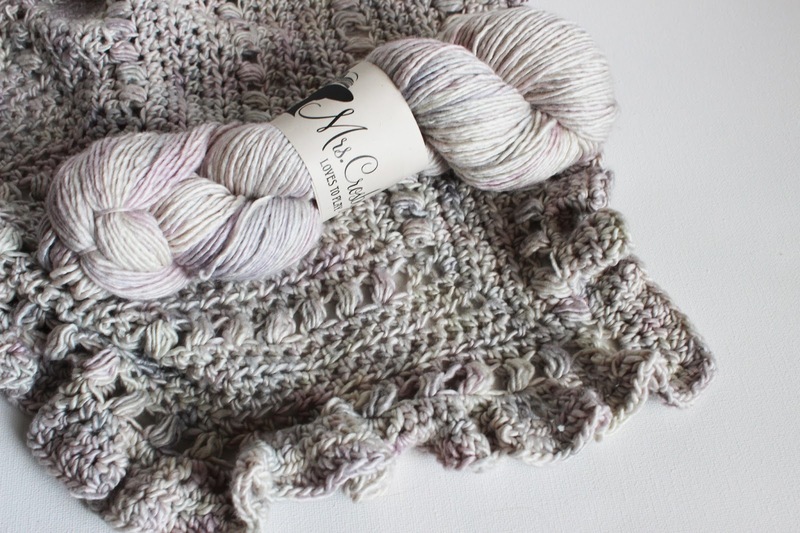 Oh...and did I mention that our remaining skeins of Mrs. Crosby Carpet Bag are now available to members in our overstock store? Time to indulge in those other colors I was mentioning and add to the stash. Coordinating Yarnbox is a lot like putting together a present for someone you don't know every month of the year. Each box has to be something special and stand out among the other boxes, but with so many great yarns, it's not as if I can pick one that 'shines' - each month has to be unique but special in its own way. This means that the texture, color application, dye method, fiber content, and structure of each yarn is taken into consideration. We could certainly fill every month of the year with similar yarns, but where would the fun be in that? For June, we elected to send a brand that has generated a lot of buzz since its launch. Mrs. Crosby is a mysterious female figure who (we assume) travels the world, spreading her love of great wool and knitting knowledge to others while exploring faraway, exotic locales. The brand is built on her mystery, and no actual dyer is named on their website -- Mrs. Crosby is a unique brand in the industry in this way. 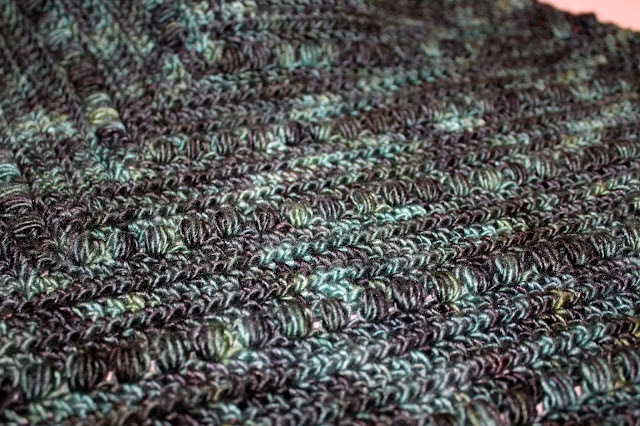 Carpet Bag, the yarn we picked for the June Yarnbox, is an 80% merino, 20% silk single with lots of shine and drape. This yarn can be worked at a true DK gauge on size 6 needles, but like most singles yarns, the softness of the spin allows for some extra versatility. I tried swatches on needles ranging from US 3 - US 9 with great results. Smaller needles, as expected, yield a tighter, less likely to pill fabric, while larger needles give a smooth, elegant fabric that will need a little extra care (but be well worth it!) I think this makes it well suited to everything from small accessories, like a pair of feminine handwarmers, all the way up to garments. For me, there's something wonderfully special about puff stitches! The knitting pattern, Kala, did equally well with members and already has dozens of projects being made on Ravelry thanks to designer Gabrielle Henry's Kala KAL. Want to join in the fun? Second Annual YB Christmas in July Swap! 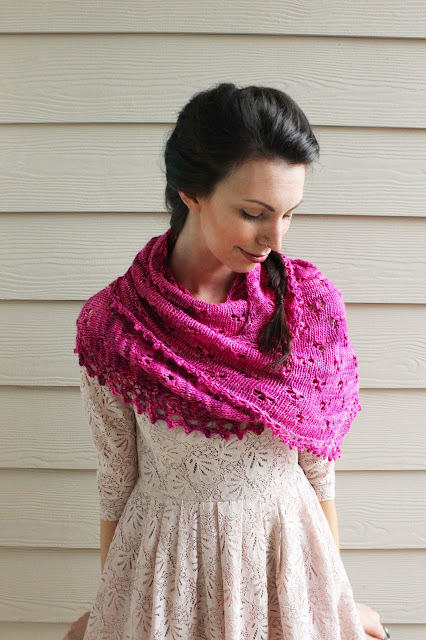 If you aren't active in our Ravelry group, here's yet another reason to go over there! We're in the middle of wrapping up our moderator-run, second-annual Christmas in July gift swap. 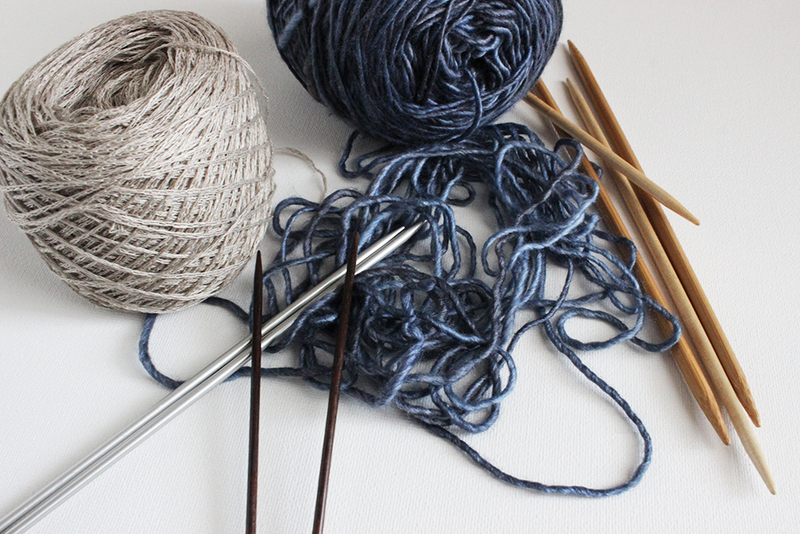 This event, which started in 2014, celebrates the slightly slower summertime for Yarnbox members with a member to member exchange. 70 amazing folks from all over the world signed up in mid-May for the swap and planned packages tailor made for their swap partners to ship out in July. 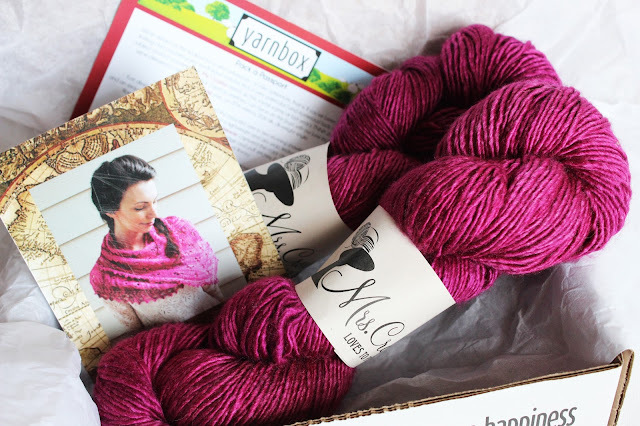 Yarnbox members love to spoil each other! 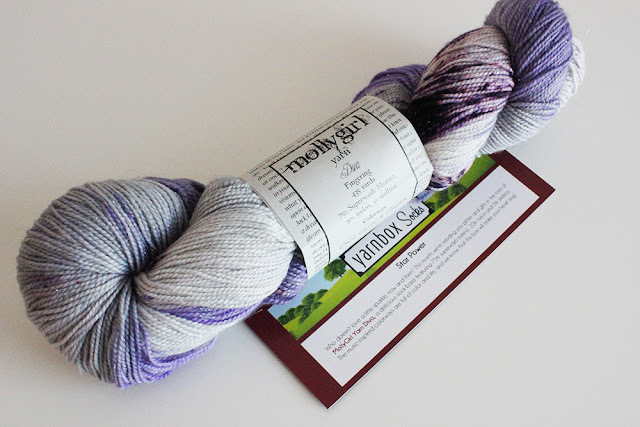 As the primary admin for the group and also someone very active in the Yarnbox forum, I can never resist participating in this swap, so of course I had to sign up! I always have a lot of fun getting to know another member really personally, and this round I had Denise, who loves ocean colors, Boston Terriers, tuxedo cats and, of course, great yarn and knitting. While I was busy rounding up some of her favorite things, my secret partner, Ana, was busy putting together a fantastic package just for me! One of my favorite things about Ana's package was her sense of humor. She wrote out a note to me (complete with Spoiler Alert) telling me why she chose all the special things to go into my Totoro themed package. For those of you not familiar, My Neighbor Totoro is an adorable anime film from Studio Ghibli. It has beautiful, whimsical details that have captured the hearts of people the world over (including mine!) I am a huge Studio Ghibli fan and through her research, which we call stalking for the swap, Ana put together a really fantastic themed package for me. When I opened my box, I was greeted with the Paperchase bag you see on top with a doily print (I've been carrying it non-stop since I opened it -- great knitting bag or all purpose summer tote!) 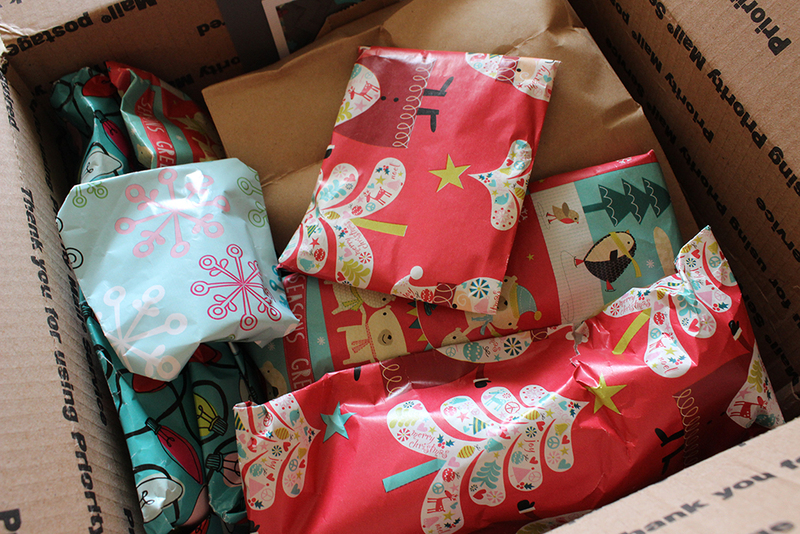 Then all these little wrapped packages were waiting. 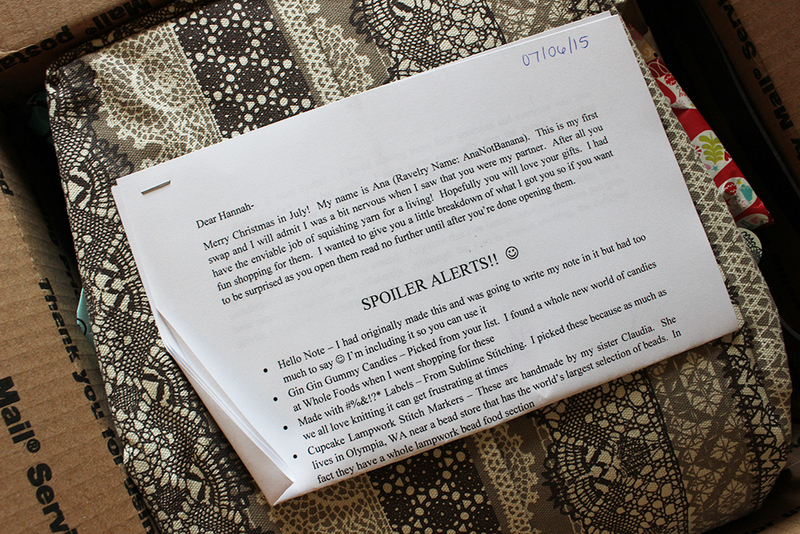 I love that Ana spoke to the Christmas in July swap by wrapping them in holiday papers! The goodies were fantastic! I am truly and utterly spoiled, especially by the amount of personal time Ana put in crocheting the Totoro dolls and making sure all the details were just right! 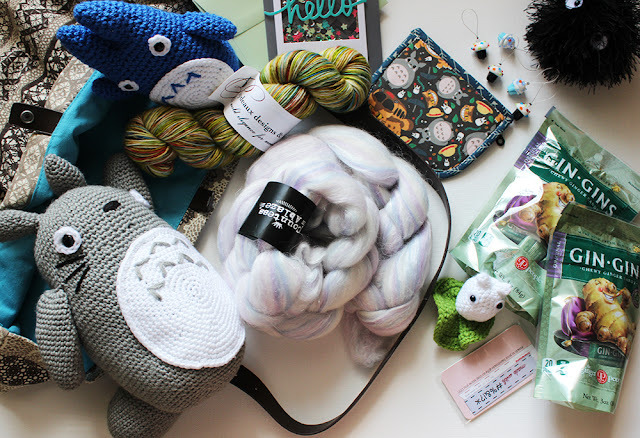 She got me yarn, fiber, and some of my favorite candies, stitch markers and an adorable storage bag -- and so much more! Don't miss out on the fun of this swap (or any other Yarnbox events) -- join us in the Ravelry group right now! Casting on for the Yarnbox Summer Sweater KAL/CAL! My choice for this event was inspired by a recent Ravelry blog feature chatting about combination projects. Boxy, one of my favorite sweater patterns from Joji Locatelli, is a great candidate for many yarns. I knit one a few years ago in some handspun yarn and have been thinking about making another, so when I saw Pooki's version on Ravelry that combined Boxy with the Cancun Boxy Lace Top pattern, I knew that's what I wanted to make with the Shibui Linen from our June Luxe shipment. I also wanted to swatch in Mrs. Crosby, which seemed like a wonderful alternative for cooler climates. With lots of shine and drape, it's certainly a good candidate (although I decided against it, since at the tight gauge of Boxy it was a bit too warm for Tennessee!) As you can see, that required a lot of different needle sizes to determine! 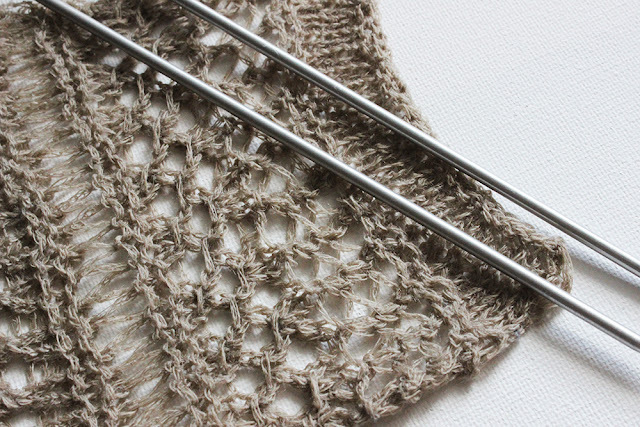 Swatching is perhaps the most important part of the planning of any gauge-dependent garment. I didn't just want to swatch for Boxy's pattern, but also see how all of the lace stitches from Cancun Top would translate into Linen. If your pattern has lots of textured stitches or stitches you're unfamiliar with, it's a good idea to try them all in your swatch - nobody ever made a rule that swatches always had to be 4" x 4" - you can certainly make them larger. As you can see, my swatch got a little wonky. Part of the benefit of practicing the stitches is that you can make any translations from flat knitting to in the round if you're altering or modifying a pattern like this one. I found that I misjudged how many yarnover pairings there were and my swatch ducked in a bit. Good thing this happened on the swatch and not on the final sweater! The last step in any good sweater swatching process is the washing and blocking. There were a lot of questions about how to wash and block linen this month, and lots of great answers shared. Linen is one of the world's most durable fibers, so your final piece can be washed in the washing machine and even dried in the dryer. 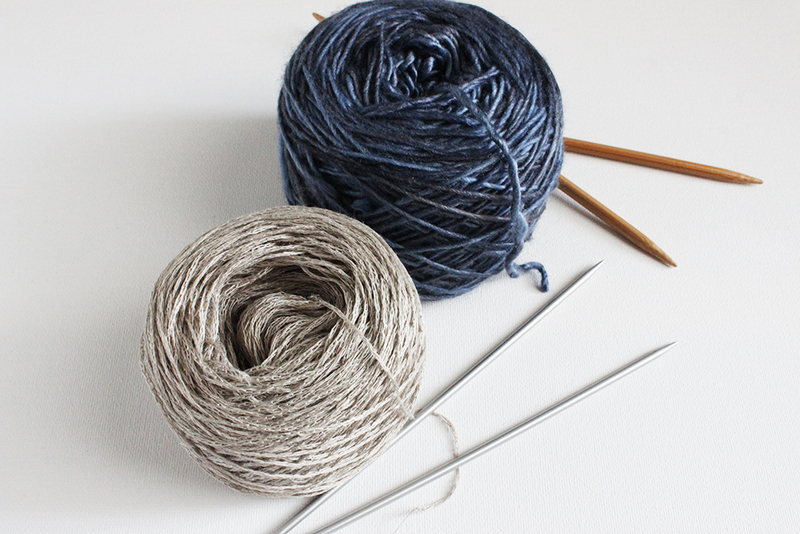 In fact, we sort of recommend being a bit rough to your linen yarn for the first few washings to soften it up! For my swatch, I swirled and scrubbed it around in a pool of warm sink water for a bit, then hung it off the towel bar to dry, stretching it a bit to mimic the weight of a finished garment. I'm happy with how the swatch turned out and I'm now ready to cast on! Are you joining us for the KAL/CAL event? What are you working on? The Luxe boxes are some of my favorite to put together and curate each quarter. I love coordinating some of the best yarns I've been able to find with notions makers and companies that I feel are worthy of your attention as Yarnbox subscribers. It's almost like being involved in a swap when each Luxe box comes out -- everything has been planned in secret, so doing the big reveal on a Luxe shipment is like having your swap partner open their box at long last! While Yarnbox was still growing, I spent some time working for other companies, doing all sorts of little odd jobs, including writing. Shibui Knits had me write copy occasionally for newsletters, and one of the perks of working for a yarn company is that you usually get to try a few of their yarns at wholesale. Linen is one of the yarns they sent me to sample for a piece I was writing on the Mix concept. Shibui Linen is unlike many other linen yarns on the market, in that it is lightweight, relatively soft (for linen), and is a chain ply. I love chainette yarns because they basically allow fibers that normally have specific rules about drape and weight push their boundaries. 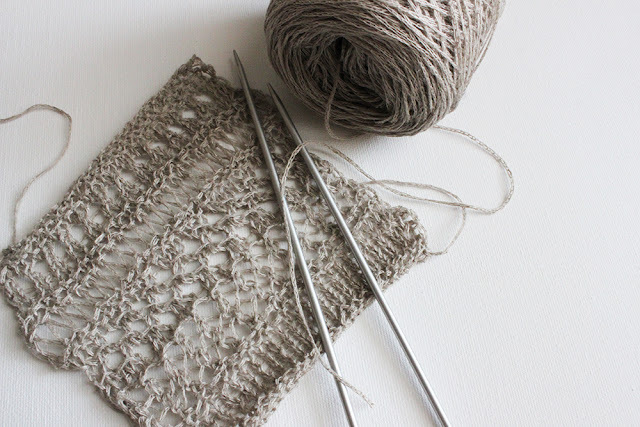 Shibui Knits' Linen breaks out of the standard linen structure by simply having structure. Where many linen yarns hang lifeless, limp, and heavy when knit or crocheted, the chainette of Shibui Linen adds a little body to the base, creating knits that retain their shape better in addition to looking and feeling crisper. When the time came to design the summer Luxe box, the best linen your yarn money can buy seemed like the natural choice for our members. I knew from working with Shibui Knits that Darcy Cameron (company owner) keeps a tight ship, and her team would help determine the feeling of the box in a way that worked best for them. It seemed only natural that a company focused on combining the perfect yarn with pattern would design the garment for this box in-house. 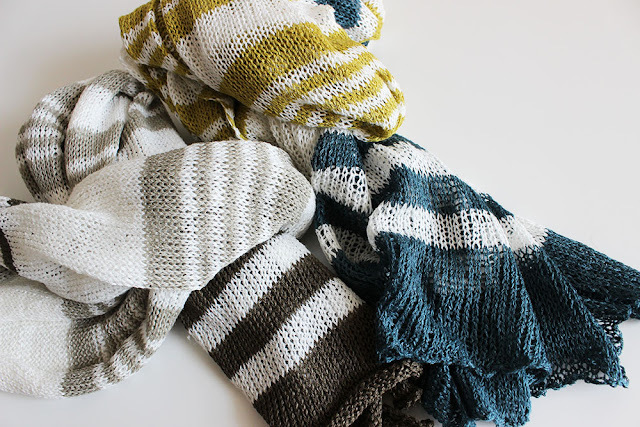 The scarf kits, which came in three distinct color groupings, create lovely mid-season accessories that are simple for even beginners to knit. Of course, Luxe couldn't be a luxury box without the inclusion of extras! One of my favorite project bags is a box bag from Splityarn. 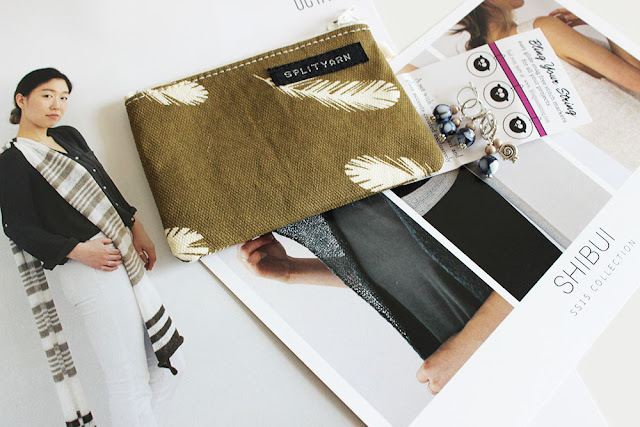 Caro Sheridan hand-sews beautiful project bags with quirky, modern, and trendy fabrics. The bags are all the right blend of sturdy and soft, with high-quality details like contrasting zippers and fabric labels. While I would have loved to include a boxy bag in every kit, it seemed more reasonable to put what Caro calls a 'Wee Notions Pouch' into each Luxe shipment. These pouches are the perfect size for storing stitch markers, like the shell and wood adorned ones from Bling Your String that this kit also included. As usual, Aryn doesn't disappoint, this time with larger rings (as requested by our members) and another selection of beautiful materials. Many members decided that the seven skeins included were great for a scarf, but even better for a garment, and are now joining us online in our impromptu Ravelry KAL/CAL for Summer Sweaters. If you're interested, come follow along! The KAL started on June 25th and will end October 1. We don't do a lot of yarns we'd call novelty through Yarnbox. Mostly because our members have given us feedback that they aren't really into it, and also because many novelties are synthetic fibers (something we never, ever feature as the main base for a yarn.) That said, occasionally even crafters who love the classics like to branch out a little and have something special to work with. Sock yarn is a great place to experiment with unusual dyeing methods and colors, but what about textures? 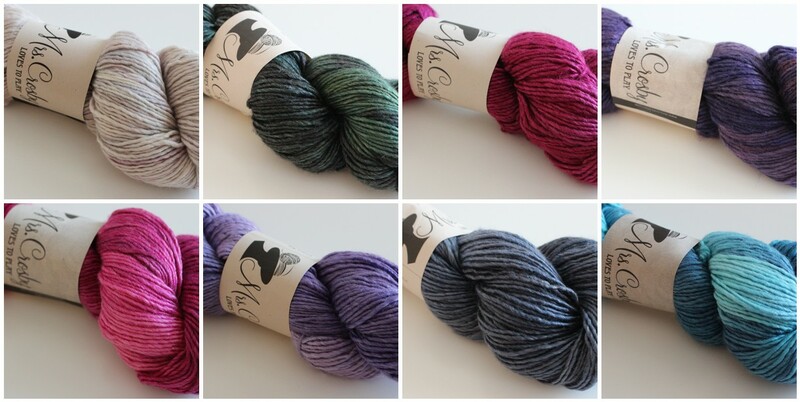 I think a little glitter is a welcome addition to the standard lineup of classic sock yarns. Over the past year, I have seen so many sparkling sock yarns, of varying textures. 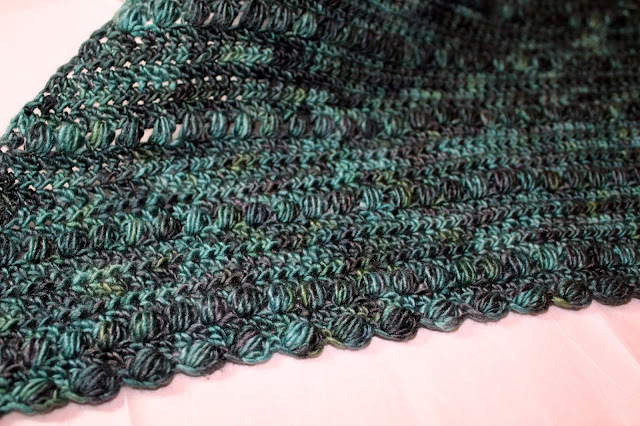 Sometimes while they'll feel soft in the skein, the addition of Stellina, Angelina, or Firestar (all sparkling elements) can create a rough texture when worked into a fabric. The tiny fibers poke and prod the user and make it difficult to wear these glittering beauties next to skin. So when Michael suggested that we do a sparkling sock yarn, we started the hunt for the perfect one -- not too much scratch with our sparkle! Mollygirl Diva is a standard sock yarn for the most part: 75% Merino and 20% Nylon make for a durable, reliable sock yarn. The added bonus of 5% Stellina (labeled as 'other' on Ravelry), adds just a little oomph to this yarn, creating a great choice for those who like to add some glitz to their knits. 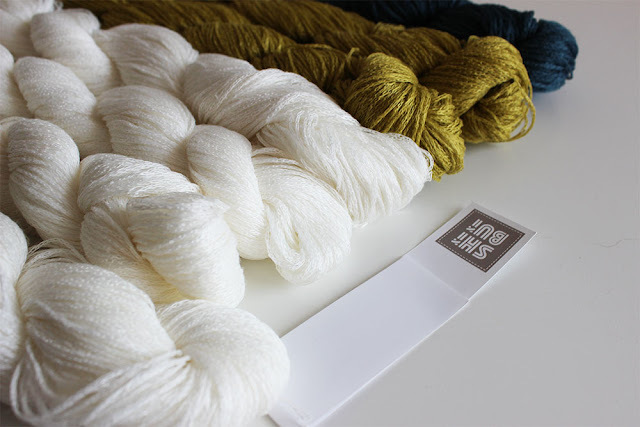 The most important part about choosing this yarn was that it met not only the visually pretty requirement of a sparkling sock yarn, but also the touch and feel part. Feet are sensitive! I am proud to report that this yarn is sock-worthy, and in fact knits up quite smoother than many of its competitors, as evidenced by the beautiful socks that designer Cynthia Levy designed for this box. The Razzle Dazzle sock pattern is adorned with cables. In Mollygirl's Red Lip Classic colorway (no doubt inspired by the Taylor Swift song, Style), this sock shines. Many members have already worked it up and found that the yarn is excellent at showing off every stitch and the sparkle effect is enhanced by the lacy eyelets and twisted stitch textures. For the photoshoot, I didn't want anything to draw away from the beautiful textures in these socks, but it seemed like taking photos against a plain wall background (or plain white) would be too boring. I wanted something that spoke to the inspiration for the colorway, the stark contrast of red on white and black (classic colors on their own) and hinted at a classier glitz and glamour. I found exactly what I needed, oddly enough, in the 1910 tile bathroom of my parent's house! With honeycomb tile on the floor and subway on the walls, all grouted with black, it made a stunning contrast to the red socks.